The cover of NASA's 2015 fiscal year budget proposal released on March 4, 2014. NASA is seeking an essentially flat $17.5 billion in funding for 2015, a budget that would invest in astrophysics and planetary science programs, while maintaining its biggest projects. WASHINGTON — NASA's 2015 budget would remain essentially flat at $17.5 billion under a White House spending proposal unveiled today (March 4) that would hold the line on the agency's biggest space programs while laying the groundwork for major new astrophysics and planetary science missions. However, a large airborne infrared telescope known as the Stratospheric Observatory for Infrared Astronomy (SOFIA) would be grounded unless NASA's partner on the project, the German Aerospace Center, steps up its contribution, a senior agency official said ahead of the budget rollout. As part of the roughly $5 billion Science budget the administration proposed for 2015 — about $180 million less than the 2014 appropriation — NASA's Astrophysics division would get $607 million, $14 million of which would be for preliminary work on the Wide Field Infrared Survey Telescope: a dark-energy and exoplanet observatory that would utilize one of the two 2.4-meter telescopes donated to NASA by the National Reconnaissance Office in 2012. Planetary Science, meanwhile, would get nearly $1.3 billion, about $65 million less than Congress approved for 2014. The money would allow NASA to continue work on a new sample-caching Mars rover, based on the Curiosity design, that would launch in 2020. It would also provide $15 million for early work on a robotic mission to Jupiter’s moon Europa that would launch sometime next decade. In 2014, Congress approved about $80 million for Europa mission studies. 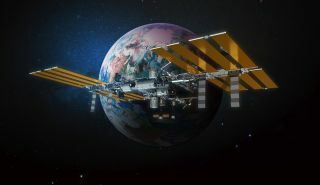 NASA is once again seeking more money than lawmakers have been willing to provide for an ongoing competition to build commercially designed spacecraft to take astronauts to the international space station by late 2017. NASA wants $848 million for 2015, nearly $150 million more than Congress provided in the 2014 omnibus bill, which is the high-water mark for the program. At the same time, NASA is seeking about $2.8 billion for the Space Launch System (SLS) heavy-lift rocket and companion Orion deep-space crew capsule — about $300 million less than Congress appropriated in the 2014 omnibus. SLS and Orion would debut in 2017 on an uncrewed test flight to lunar space, with a crewed mission to follow in 2021. The 2015 budget provides no official estimate of the total cost for NASA's proposed asteroid redirect mission, which the agency announced in its 2014 budget request. In this mission, a new robotic spacecraft launching later this decade would redirect a small asteroid to lunar space, where astronauts could explore it by 2025 using SLS and Orion. The White House proposed spending $133 million in 2015 on capabilities needed by, but not specific to, the asteroid mission: next-generation solar electric space propulsion, and improved asteroid detection. NASA said last year that the redirect mission, which has received a chilly reception on Capitol Hill, might cost roughly $2 billion. NASA also must decide between two different approaches for the asteroid redirect mission: corralling a small, free-floating space rock, or chipping a boulder-sized chunk off of a much larger asteroid. The decision is expected in February 2016, around the time the agency’s next budget request is scheduled for rollout, the senior official said. NASA's biggest science program, the James Webb Space Telescope, would get about $645 million in 2015. That is in line with the agreement NASA and Congress reached back in 2012, when the agency completed a massive mission replan to get the flagship astrophysics observatory back on its feet after technical challenges and managerial miscues busted its original budget by billions of dollars and delayed its launch for years. The observatory, now expected to cost roughly $8.8 billion for a five-year mission, is scheduled to launch in October 2018 aboard Europe’s Ariane 5 rocket from Kourou, French Guiana. The SOFIA mission was not so lucky. NASA says it can no longer afford its share of the operating costs for SOFIA, a 2.5-meter telescope mounted on a modified Boeing 747 aircraft that makes observations in spectra ranging from optical to far-infrared. SOFIA will be confined to the hangar this year unless Germany steps up its contribution, a senior NASA official said. The agency spent close to $90 million on the program in 2013, and had been planning to spend about that much through 2018. Finally, the 2015 budget request contains a $900 million in NASA funding as part of the White House's $56 billion Opportunity, Growth, and Security Initiative, which debuted officially March 4 with the 2015 federal budget request. The measure, which the House's Republican leadership has already declared dead on arrival, would erase the remaining nondefense sequestration cuts for 2015. The addition of the $900 million would being the White House's total request for NASA to $18.4 billion. Follow SpaceNews writer Dan Leone on Twitter @SN_Leone. Follow SpaceNews @Space_News_Intl and on Facebook.